One of the things that almost every travelling fan I’ve spoken too is agreed on is the lack of nationwide transport options here in South Africa. I’ve concluded, despite what anyone says, the only real way of getting around the country to gamesis to fly or drive. Bus routes are slow, disjointed and feature questionable security. And while South Africa does have some trains, the locals consider them more of a novelty than a legitimate means of getting anywhere. And so with this in mind, I find myself with a rented Kia Picanto in a hotel in the town of Clarens. Well OK, the Kia wasn’t allowed into the hotel. It’s more or less half way between Durban, where I’ve just come from, and Bloemfontein, where my next game is. I didn’t have any accommodation arranged for the three nights in between these two cities, so I’m “discovering” the Kwazulu-Natal and Eastern Free State regions. 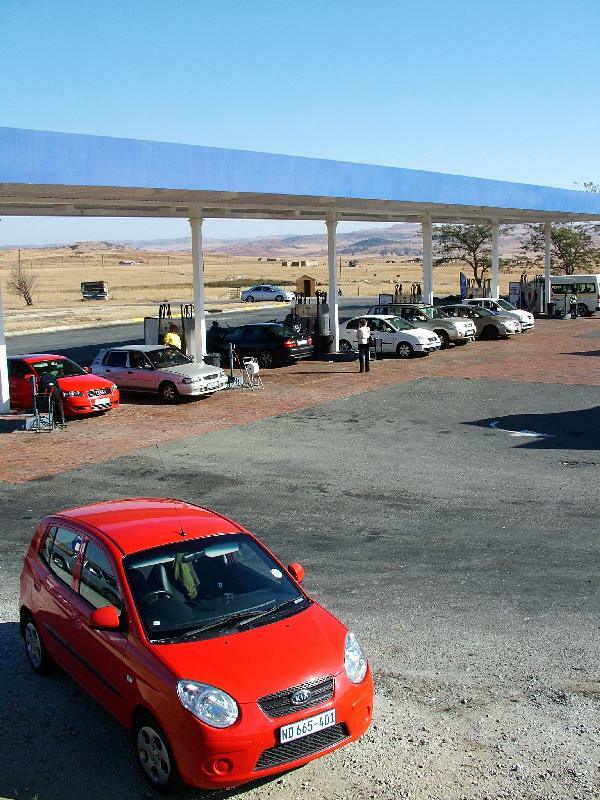 The area is truly beautiful to drive through and while the tolls are costly (R120/€14 in the four hour drive), you save time and money by taking a car. I also got to take some fun scenery shots on my phone while driving. How illegal. But how fun! I’d upload a few if I wasn’t on a very slow internet connection that is barely capable of loading an email. But anyway, enough talk of Free State, as I haven’t said anything about Durban yet! The place they’ve dubbed “the warmest place to watch the World Cup” is a real city of contradictions. On the one hand you have suburbs bubbling with trendy bars and huge malls and an amazing beachfront with its water parks, restaurants and smart hotels. Then tucked in between these two areas you have the city centre which is one of the most rundown, murky places I’ve ever seen. Fill this landscape with a huge Asian population, lots of African tribes (predominantly Zulu though I think) and close to a million white European/Afrikaans and you get a rather diverse melting pop of a city. And… drum roll…. it gets a big Nigel thumbs up. 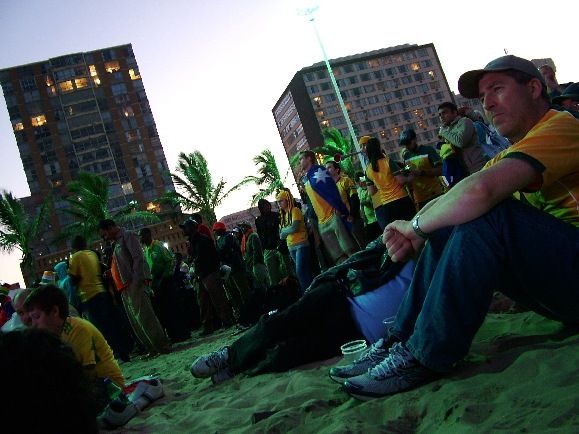 As well as the lack of transport options, and whisper this in case the FIFA suits hear, South Africa doesn’t really have accommodation for everyone during this world cup either… This means, some cities are literally “full up” around match days and don’t have any hotel or hostel rooms. This forces you to be innovative with where you stay. Through the website, iStopover.com, I was lucky enough to get set up with a room in an apartment just a five minute drive into the suburbs for my four nights there. The flat was owned by a Kenyan plant biologist who decided to lease out her spare room to anyone who wanted it for the four weeks of the tournament. It created quite a different setup compared to the European-style hostels I’d been in up to that point where they’re full of football fans. She had been living in Durban for the last 12 years having moved there after studying medicine in Oxford University. She had nothing but good things to say about Durban and I got the absolute gem of an anecdote of how the only time she’d actually felt threatened in the past 15 years was when she was in London and decided to take a tourist trip to lovely Brixton in South London. Never a smart move. My host wasn’t there on my first night though and so I watched the South Africa versus Uruguay match with her housekeeper/cleaner who was enlisted to greet me and spend the first evening with me to check I wasn’t mental. Me and “Nolty” had the craic though. I learnt more about the townships, languages and cultural structures in the city from her than any museum could have told me. Also watching a Bafana Bafana game with a South African is funny. But of course being taken apart by Uruguay and a man who has a very fond place in my heart for his repeated tormenting of Liverpool, Diego Forlan, was less amusing to Nolty. 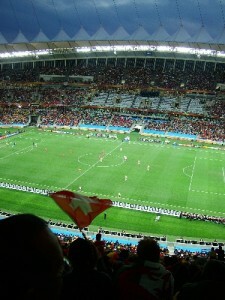 Of course, before even getting to the apartment I had the drama of trying to make the Spain V Switzerland game on time. Because it was the day after Cote D’Ivoire and Portugal, I had no option but to fly, and the only flight left last month when I went to book was a 1.15 flight out of Port Elizabeth. This would have me in Durban for 2.25, I’d grab my taxi for the Durban’s Moses Mabhida stadium and get in there at 3.10 with 50 minutes until kick-off, just enough time to grab a Coke™ and practice the words to the Franco version of the Spanish national anthem, La Marcha Real. Unfortunately Africa being Africa my Kulula flight was 45 minutes late and my luggage got held up, so I arrived at the stadium with 15 minutes already on the clock. The game was still a real treat though, absolutely fantastic to see Xavi and Iniesta work their magic in the middle of the park for the Spanish and to see the funniest goal of the tournament so far as Fernandes bundled the ball over the line to give the Swiss a shock 1-0 victory. I had some great Swiss army or cheese puns at the time but forget them all now, ah dear. The Dutch game was quite boring, Van Persie didn’t turn up at all and I was just wishing that Ruud van Nistelrooy was on the bench to come on for the dutch. But they did the job and find themselves with 6 points and in the second round having barely exerted themselves or entertained the rest of us. No idea what’s going on with all the European teams in the tournament, but I think my combination of bets I made pre-tournament on Brazil and Argentina to take home the top prize are looking very nice right now. I’ll also admit the prospect of Spain finishing second in the group and facing Brazil at one of the last 16 games I’m attending is quite mouth-watering… Though anything could happen with those games, so let’s just wait and see. So aside from a bit of chilling on the FIFA Fan Zone beach, a stupidly big mall, Toy Story 3(d), a water park and a creepy visit to a Hare Krishna temple… that was Durban! This entry was posted in Durban, South Africa and tagged Clarens, driving, Durban, Free State, Kia Picanto. Bookmark the permalink. Nice work Nigey. Although I cant believe and yet can at the same time that you put the little TM after Coke. Truly sad. We miss you! Well, that little TM was a joke at the ridiculous level of branding that is prevalent everywhere you look at this blooming competition. You can only drink Budweiser, Coke or Powerade within a one mile radius of a stadium. FACT. Nigel, please try to remember the Swiss army/cheese puns! I am enjoying your blog despite my allergy to football. All the way from Oz too! They didn’t beat Ghana 14-0 or whatever it was they needed to score and so are out of the competition! The Australian commentary is ridiculous. They don’t even pretend to be slightly impartial. 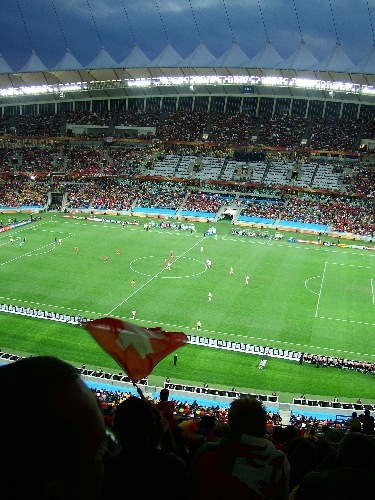 All the commentators were wearing their socceroos scarves yesterday during match analysis! By Ghana I meant Serbia! Oops.